The legendary desert boot has made it's come back and is now more popular than ever. This round toe shape desert boot by Roamers is made of full leather uppers, lining and a PVC crepe sole. The round toe desert boots are aimed to provide extra room for people with slightly wider feet and for those who wish to have that little bit of extra room. 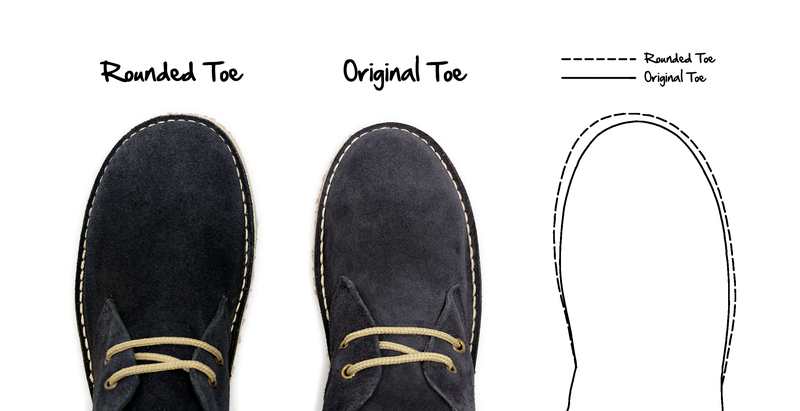 Click here to see the difference between the "Original" shape and the "Round Toe" shape. Available in 4 stylish and fabulous colours. Click here to view all colours. We advise female buyers to buy one size smaller than your normal size as these are a unisex fitting. This is not the first pair I have bought. I like the round toe and fit. Two slightly negative experiences: the uppers last longer than the rubber sole/heel which cannot, apparently, be repaired; the insole lining cover doesn't stay in place five minutes - can't you use an adhesive which will secure it? Very happy with my new boots. My last pair lasted years and although tatty are really comfortable. I am looking forward to making friends with my new boots!